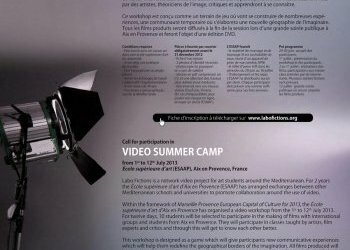 The Art School of Aix-en-Provence proposes the creation of a Mediterranean video network based on the schools with associated cultural partners. Faced with geostrategic issues, information overflux, multiplying  experts ‘ analyses from everywhere, Man’s permanent search for their own expression of the world leads us to seize what surrounds us with our noble freedom of thought. Art schools’ highest mission is to set up the conditions for those singular minds to create and express their world. The Mediterranean has always been a place for conflicts simultaneously bringing about sharing and exchange. Today, people share common global representations/images while at the same time asserting , sometimes with violence, their own identity. This paradox is at the heart of contemporary creation, with video as a priviledged medium of expression for this paradox. Bringing students from Mediterranean art schools to work together around one shared project is in itself a way to recreate a space for the circulation of people and works of art. The 10-days event (festival) would include the conception, realization and demonstration (final show) of the films. In order to build this festival, a network of partner schools in the Mediterranean must be created, as well as a collection of collective and shared video works. We would like to work on fiction(s). Indeed fiction allows to build worlds and opens up infinite possibilities. The world of fiction can make us share and renew an infinite variety of forms. We can convey the move and flow of stories through browsing systems that will enable us to link all the peculiar moments of life we want to focus on. This projects can be seen as a playing map in which we collectively define the rules of the game, and in which we define together step by step the narrative strategy that leads to the creation of a collective story. of narrative experiences crossing eachother and drifting along with encounters. Circumnavigation and coastal navigation could be our model for a type of narration that builds itself, enriches , changes directions along with the currents of imagination, from one port to another. exchange of footages, crossed story writing, cadavres exquis etc. • Show the work done in the existing festivals of the schools’ countries. The festival can be seen as the first achievement/realization of the Mediteranean Art Schools network. Each school sends teachers and students for 10 days of marathon video creation festival. Mixed working groups are formed, to merily and hastily produce films all together. A final public exhibition/projection of works is organized.